This Adorable Baby Polar Bear Needs a Name! 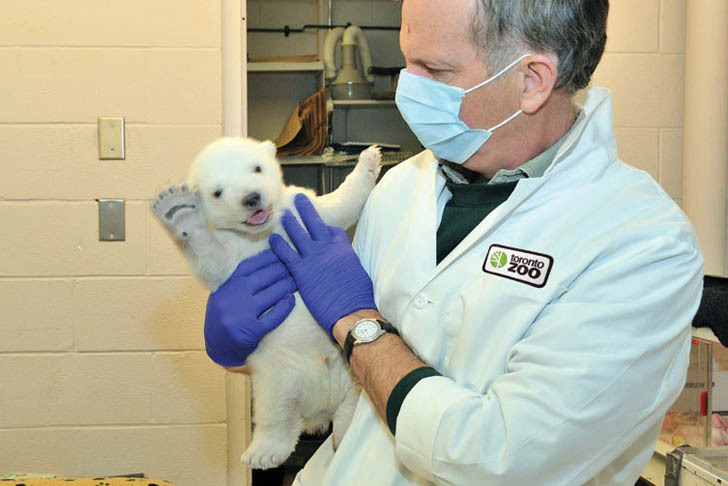 Say “hi” to the new and extremely adorable baby polar bear who was born at the Toronto Zoo just a couple of days ago. The zoo’s staff couldn’t come up with a name for the newborn, so instead of racking their brains, they are hosting a contest through Facebook instead! Engaging kids and adults in the naming process is a great way to get them excited about animals, but we’ve got to say, we think this baby bear could do better than the already suggested Snowball, Q-Tip, Playie or Aspen. So go on and think of a good name — but bear in mind, this fluffy little bundle seems to be a male! Since the little babe was one of three baby polar bears, I think his name should be TRIO in memory of his brothers. Toro. That's what I think. Say "hi" to the new and extremely adorable baby polar bear who was born at the Toronto Zoo just a couple of days ago. The zoo's staff couldn't come up with a name for the newborn, so instead of racking their brains, they are hosting a contest through Facebook instead! Engaging kids and adults in the naming process is a great way to get them excited about animals, but we've got to say, we think this baby bear could do better than the already suggested Snowball, Q-Tip, Playie or Aspen. So go on and think of a good name -- but bear in mind, this fluffy little bundle seems to be a male!